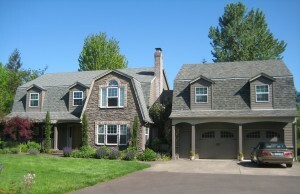 Corvallis has many middle-aged homes that can use a facelift. 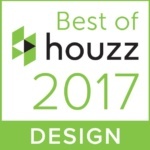 Sometimes the look of a house can be dramatically improved without huge structural changes. Exterior improvements can range from adding a bay window to a whole new facade. Facelifts can be done on their own or combined with interior work that you want done at the same time. A new entryway can often add interest and drama to a plain exterior. If your home calls for a gable being added then this can enable you to add some space to an upstairs bedroom or bath. If you’re wanting more space and considering an addition, the addition can be incorporated into an overall change to the facade. Ask your remodeler for pictures of homes they have transformed in this way. The home pictured here went through a number of stages of evolution. 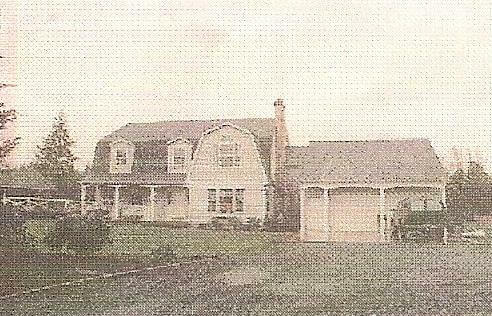 The photo below is unfortunately rather grainy, but it is from the original real estate advertisement and is the only photo we have showing the house in its original form. First we added a mother-in-law suite above the garage which gave the family important space but also enhanced the look of the home. Then in stage two we replaced all the windows and installed lap siding on much of the home. Most recently a stone facade and new paint job polished off the look and transformed this farmhouse to a stately country home. 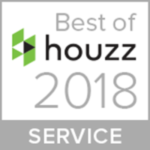 It’s important to have any major change to your home designed professionally and built by a company that has experience with similar projects. If carefully planned, facade changes can dramatically increase the value of your home.